The panel included Christopher Koelsch ’93, president and CEO of the Los Angeles Opera; photographer and designer Jacqueline O’Neill ’13, founder of the Blockchain Art Collective; Emily Orr ’06, assistant curator of modern and contemporary design at the Cooper Hewitt Smithsonian Design Museum; Cathy Cahlin Ryan P’22, a television actor best known as Corrine Mackey on The Shield; and screenwriter and television producer Shawn Ryan P’22, creator and co-creator of series such as The Shield and S.W.A.T. With each panelist’s unique professional experience providing the lens of their perspective, the dialogue touched upon key things that creative expression can accomplish both for particular audiences and the larger public — with the right leadership. For example, “the purpose of coming together for a live performance is one of discovery, of catharsis, of communal experience, where you can think the big questions about humanity,” said Koelsch. “Access to that is a fundamental human right, so we are all about trying to reduce all kinds of actual and perceived barriers.” Ways to do that, he said, include providing access to pioneering and experimental artists, offering education and community engagement programs, and casting shows with people who mirror the population. Multidimensional casting is giving us all these new fabulous voices, which is more interesting than seeing the same people over and over. “This panel is one of many new efforts we are launching to help students connect their academic focus in the arts with the limitless career paths that welcome their skills and passion,” said Michael Sciola, associate vice president for career initiatives. While on campus, the panelists also conducted informational interviews with students, participated in a networking luncheon with students, and provided helpful insight about their industries to the career services advising team. 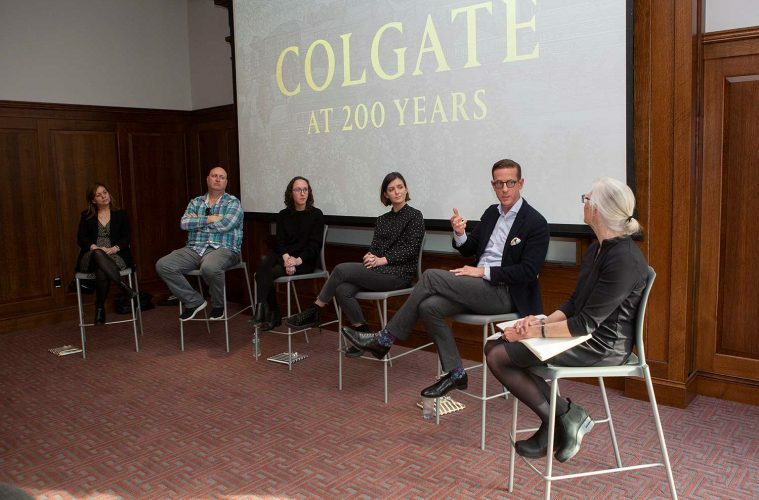 The event was part of Colgate’s Bicentennial celebration of Leadership at 200 Years.